This, folks, is a classy frozen meal. When it comes to frozen dinners there are many terrible ones and a few tasty ones – then there are the classy ones. A classy dish is one that turns from frozen, straight-from-the-supermarket food into something that makes you feel like a real person – a dish you’d be happy to serve your family, not just shovel into your mouth alone. Our old friend Hake en Papillote was such a classy dish, and TJ’s Kung Pao Chicken is another. It tastes so good, and cooks up so easily, that and looks so nice on your plate (peanuts and spicy red peppers included!) that you can’t help but feel like a skilled chef. Before I get into exactly why this Kung Pao is so tasty, a few words on its history are in order. 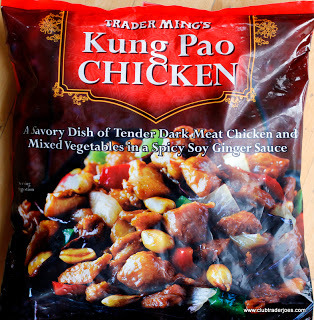 Like many traditional dishes, Kung Pao chicken has a fascinating story that needs to be heard. Kung Pao chicken popped into existence in the 1800’s in the spicy Szechuan region of China. It quickly exploded in popularity, becoming a darling of restaurants all across the nation, until it abruptly ceased to exist one day in 1966, and wouldn’t return to tables for two decades. This sudden disappearance was, of course, the fault of Ding Baozhen, an aristocrat who died in the Qing Dynasty nearly a hundred years earlier. “Kung Pao” literally means “Palace Guardian”, which just happens to be the title that noble Ding, then governor of Shichuan province, bore. Due to reasons lost to time, Govenor Ding was bestowed the honor of having this delicious, spicy chicken dish named after him. Kung Pao glorified Ding on menus across the kingdom until the sudden, alarming rise of Communism in the mid 60’s China and the ensuing Cultural Revolution. The Cultural Revolution was a period of intense fanaticism in China, and chief among its various purposes was to unmoor modern China from it’s imperial roots. Practically, this meant rewriting all of Chinese history, right down to the incidentally named local fare. As a result, from the 1960’s to the 1980’s, Kung Pao, though still served, was no longer known as Kung Pao. Officially, it was now known as “Hongbao Jiding” or “Fast-fried chicken cubes”. At the exact same time, Kung Pao was experiencing great turbulence in the immigrant kitchens of Chinese Americans. There the savory dish was suffering an identity crisis of similar magnitude as in China. 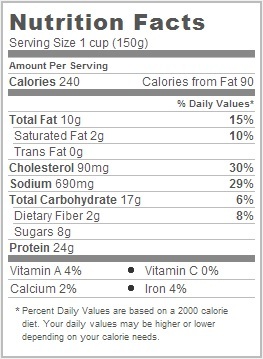 While the name persisted unchanged, its ingredients started to undergo a radical revision. Authentic Chinese Kung Pao hinges on one key ingredient, the Sichuan peppercorn – an ingredient common throughout Szchehuan cooking. These peppercorns were responsible for the unique, tingling zing Kung Pao was supposed to have on the tongue and lips. The peppercorns flowed freely into American ports until 1968, when Uncle Sam slammed the door. The problem? A botanical ailment known as “citrus canker” was devastating American crops and Sichuan peppercorns numbered among the disease’s potential vectors. With the fate of the Florida orange at stake, Sichuan peppercorns had to go. For 32 years, all the way until the year 2000, the peppercorns were banned from these shores, forcing Kung Pao to mutate into a different form – the peppercorn-free, vegetable-laden dish we know today. Communism has fallen and the Sichuan peppercorn is again freely available, but the path of western-style Kung Pao is firmly implanted in the American mind. This isn’t a bad thing – bringing a delicious new form of food into the world can never be a bad thing – and Trader Joe’s has mastered the medium perfectly. I’ve been known to bandy the word “mastery” around fairly lightly, but in this case it absolutely applies. I’ve sat down to a plate after plate of Kung Pao chicken in numerous Chinese restaurants and I can firmly say that, like minestrone before it, the Trader Joe’s version is better than all of them. I’ll be damned if I know how they packed that much goodness into a frozen bag, but they managed it. Snap open the 1 lb+ bag (cost, a damn reasonable $4.99), and you’ll find some frozen, breaded chicken, a bag of frozen veggies (bell peppers, onions, and water chestnuts and of course super hot peppers), two sacks of tangy sauce, and a baggy of halved peanuts. There are microwaveable instructions on the bag but disregard these – they’re only there to tempt the weak-willed. Your choice should be skillet cooking, which could not be easy, quicker or more rewarding. I’m generally a klutz in the kitchen, but even I can brown chicken in a tablespoon of oil, add the vegetables until they soften, mix in sauce and garnish with peanuts. Nothing more than that, and you end up with a somewhat sweet, salty, savory dish of tender chicken, crunchy veggies and yielding peanuts, all held together by a brilliantly balanced sauce and a thread of fire. The only complaint I can level against the Kung Pao is that it comes with too much sauce. Two packets is more than you need – but this is as easily solved as putting one packet aside before cooking. If only all of life was this easy. Would I Recommend It: I absolutely would. Final Synopsis: A turbulent history has culminated in this better-than-restaurant Kung Pao chicken.